Astrology, Signs, and Planets on StellarDays.com | Houses | What's The subject? The Houses - What's the Subject? The astrological chart wheel is divided into twelve segments, each one representing a major sphere of life experience. When a chart is calculated for a given event, such as someone's birth, the size of each house is determined by the time and location of the event. are the same size. Eventually, it was understood that the distance between the lines of longitude is greater at the equator	than it is at the poles. The most obvious example of this is the weakness of the Sun rays at the North Pole as compared to it's stength and intensity at the equator. Over the centuries, various methods of calculating house size were developed in an effort to more accurately reflect these differences. The most widely used of these system are the Placidus and Koch systems, in which the sizes of the houses are unequal. Campanus, Regiomantanus, and Porphyry are other systems that also calculate unequal houses. The degree of the sign that is rising on the eastern horizon of the earth at the moment of the event is known as the rising sign, or the Ascendant. The signs that follow are then placed around the wheel. The degrees and minutes of the sign on the leading edge, or cusp, of each house are determined by the calculations for the house system being used by the astrologer. The positions of the planets are calculated using an Ephemeris, which gives their positions each day at the Greenwich Meridian Time zone. They are then adjusted to the specific time of the chart being cast. 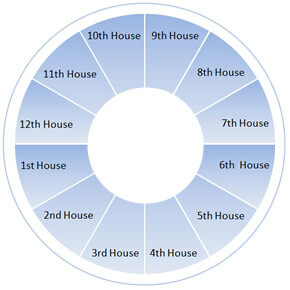 Once their degree and minutes of sign are determined, they are then placed in the houses according to the degrees and minutes of the signs on the house cusps. If you think of a planet as a visitor with a particular agenda, the sign tells you about their demeanor and the house tells you what issues they are zeroing in on. The following table is a summary of the interests of the twelve houses. There are three types of houses: Angular, Succeedant, and Cadent. An astrological chart is divided into four quadrants, each containing three houses. The first house in each quadrant is the Angular house, the second is the Succeedant, and the third isn the Cadant house. Angular houses are the most powerful houses in the chart. They have an ardent, strong, initiating energy. It is the energy of the go-getter, the self-starter. The 1st, 4th, 7th and 10th houses are the Angular houses. Planets placed in them get an extra boost in being able to forcefully express themselves. Succedent houses are the houses that "follow on" or "succeed" the Angular houses, and as such signify things that are associated with or belong to the preceeding house. They are less powerful than the Angular houses but more powerful than the Cadent houses. Their focus is stable and steadfast. The 2nd, 5th, 8th and 11th houses are the Succedant houses. Planets placed in them indicate especially long-lasting effects. Cadent houses are the last house in each quadrant of the chart and are associated with a falling away or decline of the energy represented by the Angular and Succedent houses that preceed them in the chart. They are generally weaker, less productive, and less effectve than the Angular and Succedent houses. Their focus is more mental that action oriented. The 3rd, 6th, 9th and 12th houses are the Cadent houses. Planets placed in them are not operating at full power and spend more time thinking about what they would like to be doing than actually doing it.